Beim ASCA-Trial am Wochenende hat Dash etwas Neues für sich entdeckt – mit Minimal-Training und Kurz-Aufbau von Übungen, die er noch nie vorher gemacht hatte, sind wir beim Rally Obedience im Novice angetreten und haben direkt zwei „Excellent“-Qualifikationen mit 200 und 199 Punkten (von 200 möglichen Punkten) geholt! Wir haben zwar noch viel zu trainieren, aber ich bin sehr zufrieden mit ihm; er hat die ganze Zeit konzentriert mitgearbeitet, und Spaß hat er sowieso immer, wenn man etwas mit ihm zusammen macht. Bis zum nächsten Obedience-Trial im Mai 2018 werden wir also brav weiter trainieren und dann hoffentlich nicht nur im Rally, sondern auch im „normalen“ Obedience antreten. 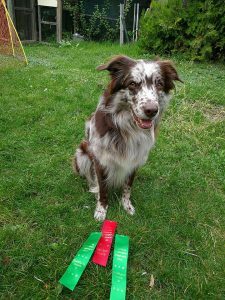 Dash discovered something new at the ASCA-Trial this weekend – with a minimum amount of training and short practise on new exercises right before the start we competed in Rally Obedience Novice and managed to get 2 „excellent“ qualifying scores with 200 and 199 points (out of 200 possible)! We still have a lot to work on, but I am very happy with him; he was focused the whole time, and he always has fun when you do something with him. So now we will continue to train for the next Obedience Trial in May 2018 and then hopefully start not only in Rally, but also in the regular Obedience class.